L’amour has stunned many women through their amazing attention to detail towards bridal gowns, formal wear and bridesmaid dresses. Their capability in designing dresses that accentuates the female bodice with a momentary presence that will turn heads. Featuring gorgeous intricate lace designs, to one shoulder chiffon dresses, to sweetheart neckline with form-fitting bodices and mini-length to floor-length gowns with trains. L’amour has outdone themselves with unique beautiful romantic dresses to rent for your special wedding day with bridal party wear or cocktail event. For more inspiration, read ‘ Beautiful Bridal Looks for Fall’ on our blog. I rented this for a wedding and got many compliments. It was really comfortable and felt really nice on. As other reviews have mentioned, it is long (I am 5ft 10 and it still covered my feet with heels on). This was a great 'safe' option for a work related Black Tie event - without compromising the 'glam'. It has a bit of stretch in it (comfy fabric and fit) so I could have gone a size smaller. This was my first time renting and it arrived early, was the most perfect fit and made me feel so glamorous! I would absolutely wear this dress again. Cannot recommend enough! 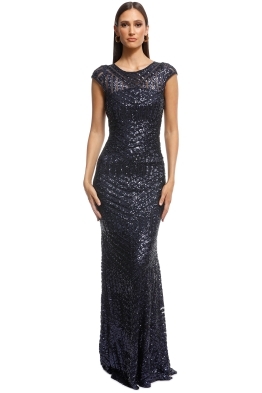 Perfect dress for a black tie wedding! I was so worried about what I would wear to a black tie wedding and then Glam Corner to the rescue! This dress was perfect. Arrived on time and looked great. And having a back up dress was ideal to ease my first time hiring jitters. I just returned this dress yesterday and it could not have been easier. Despite an issue with the postage bag missing a label the Glam team we’re so helpful and quickly got it resolved. I would definitely hire from them again! I rented this dress for a wedding and it was perfect! Such a glamorous gown making me feel just like a princess. Fits beautifully and I loved the low back feature.